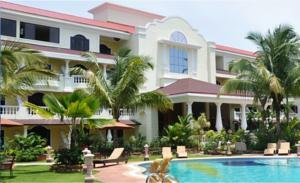 Joecons Beach Resort features a location a 10-minute walk from Benaulim Beach. This resort offers a relaxing environment, offering an outdoor pool with natural surroundings. Free parking is provided. Joecons Resort is within 10 km from Kadamba Bus Stand and Madgaon Railway Station. Goa International Airport is 25 km away. Rooms feature a panelled floor-to-ceiling door leading out into the balcony, which overlooks the garden and pool. Each is fitted with a flat-screen TV and safety deposit box. Tea and coffee making facilities are provided. Guests can relax by the pool bar or take a walk in the resort’s garden. The tour desk assists in car rentals and currency exchanges. Laundry services are available. Beach Shack features dining by the beach while seafood can be enjoyed at Joecons Garden Restaurant. Light bites are offered at Café Succoriana. Free! One child under 6 years stays free of charge when using existing beds. One child from 6 to 12 years is charged INR 750 per night and person in an extra bed. One older child or adult is charged INR 1200 per night and person in an extra bed. There is no capacity for cots in the room. Supplements will not be calculated automatically in the total costs and have to be paid separately in the hotel. Visa, Euro/Mastercard, ATM card, Maestro, Bankcard The hotel reserves the right to pre-authorise credit cards prior to arrival.